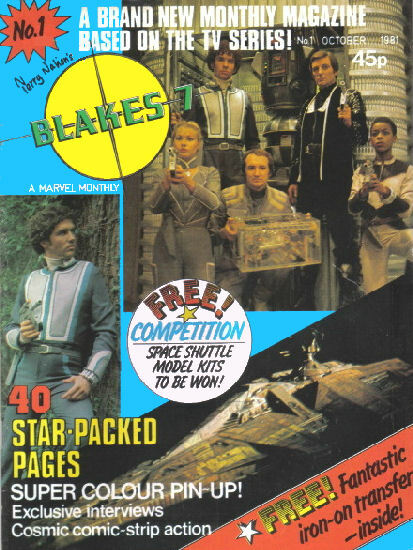 Comments: A tie-in with the BBC TV series published by Marvel UK, Blake's 7 (sometimes called Blake's 7 Magazine or Blake's 7 Monthly by fans, though both additional words are more descriptive than actual parts of the title) began publication in what proved to be the show's final year. The first issue came out in October 1981, the month after the final series began airing, and continued publication for nearly two years after the show's finale on the 21st December 1981. However, as it became increasingly clear the show would not be returning to air, the non-comic strip section of the magazine dedicated to interviews and show updates soon began running out of new material to report on, and the title was cancelled with #23 in August 1983. Marvel had published two specials during the run, in Summer and Winter 1982 respectively, and, over a decade later, would publish two more, in Winter 1994 (but noted as 1995 on the cover) and then Summer 1995, featuring new comic strips in the former and retrospectives on the show.